Carol Danvers / Captain Marvel, portrayed by Brie Larson, is an ex-U.S. Air Force fighter pilot and member of an elite Kree military team called Starforce, whose DNA was fused with that of a Kree during an accident, which imbued her with superhuman strength, energy projection, and flight. 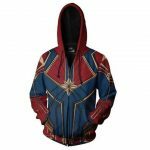 Captain Marvel is a believer in truth and justice but also fights between the aggressiveness and quick tempered character that is within her. 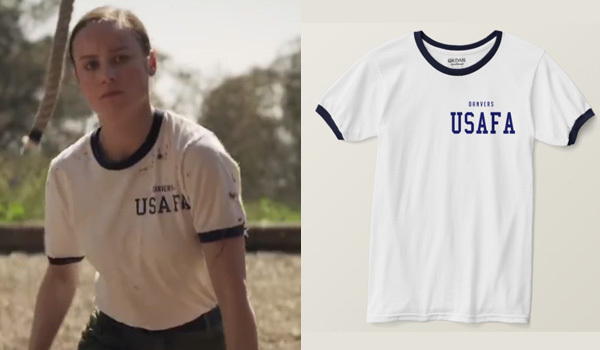 The tshirt that Brie Larson wears in Captain Marvel for her role as Carol Danvers in the US Air Force Academy is a white and navy ringer tshirt custom made for the movie. It has her name on it and just below USAFA (standing for US Air Force Academy). 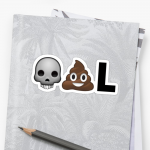 A replica has been made and is available on Zazzle. The 5.11 Class B cargo pants are a close match and are a great overall pair. 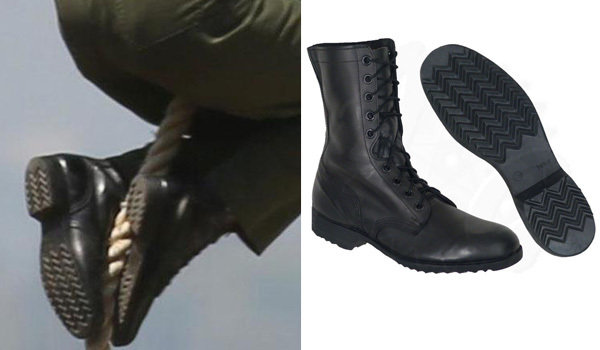 The shoes that Brie Larson wears in Captain Marvel for her role as Carol Danvers in the US Air Force Academy are black combat boots. Recognizable thanks to the chevron pattern of the sole, they are the old style combat boot for the US Military. 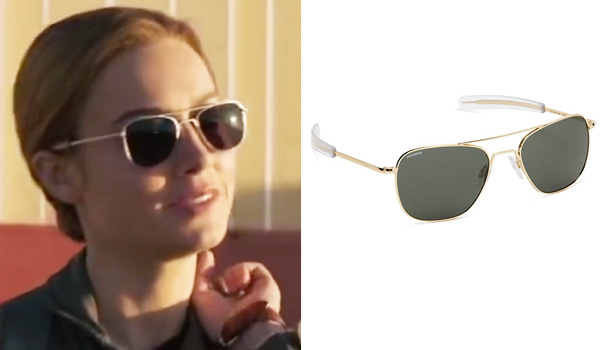 The sunglasses that Brie Larson wears in Captain Marvel for her role as the pilot Carol Danvers in the US Air Force are gold aviator sunglasses with grey lenses. They are Randolph Engineering Classic Aviator sunglasses. 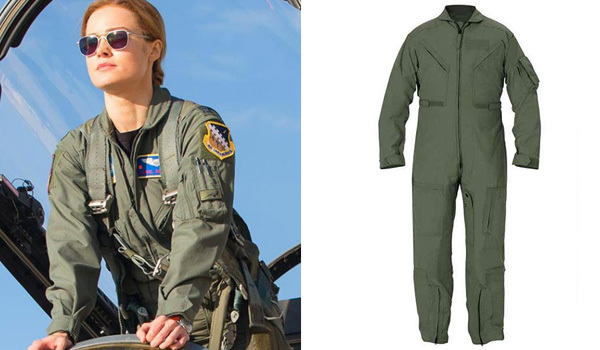 The coverall that Brie Larson wears in Captain Marvel for her role as the pilot Carol Danvers in the US Air Force is a green flight suit. The exact model is an easy find since it's the same suit worn by all real US flight crews. 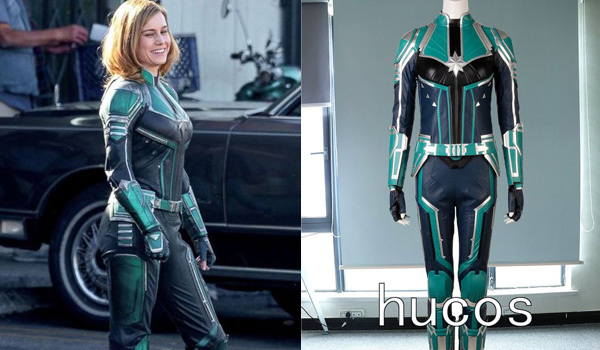 The outfit that Brie Larson wears in Captain Marvel for her role as a Starforce team member is a custom made costume for the movie. 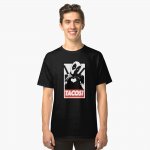 You can get a cool replica, custom made to your size on etsy at a fair price. 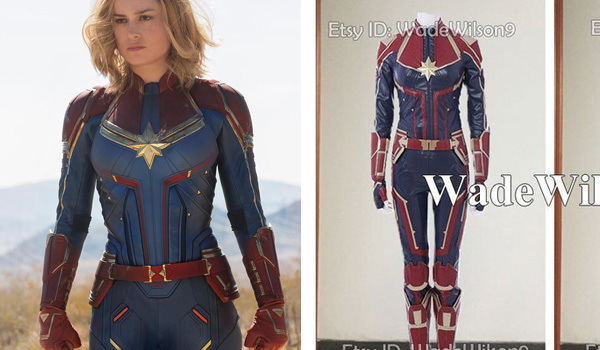 The outfit that Brie Larson wears in Captain Marvel for her role as Captain Marvel is a custom made costume for the movie. A beautiful replica is available on etsy and if you look at the comments, the pictures don't even give it justice ! Whats great about this costume is that you can also buy everything separately (vest, boots, belt, jumpsuit and gloves). Wow she’s epic and her suit is amazing plus she’s drop dead gorgeous!